Use Rapid Set 55 lb. Mortar Mix for repair and formed work. The crack-resistant, non-shrink formula is designed for strength and durability, and it works very well on overhead and vertical applications. ECOBUST Breaks Rock and Concrete in just 3 Easy Steps, Drill, Mix, Pour and watch it Bust! No jack hammering or explosives needed making ECOBUST a safe, non-toxic, eco-friendly solution. No noise, dust, vibrations, fly rock, fumes or any other environmental pollution so it is ideal for sensitive jobs, big or small. ECOBUST produces an incredible 20,000 PSI of pressure, breaking any strength of rock or concrete into any shape and size desired. Get your next demolition job done quickly and safely, without the mess. Results typically occur within 24 hours, cracks may start to appear within 2 hours, depending on temperatures. TYPE 1 is for temperature climates between 20 to 35C (68 to 95F). 44LBS fills 35 lineal feet of 1.5" diameter hole OR 70 holes at 6" deep at 1.50" diameter. QUIKRETE FastSet All-Crete is a fast setting non-shrink structural grout for concrete construction and repair such as concrete floors, roads and bridges. It can also be used for bolts and posts into concrete, grouting under columns and base plates and for filling voids and cracks. 55 lb. 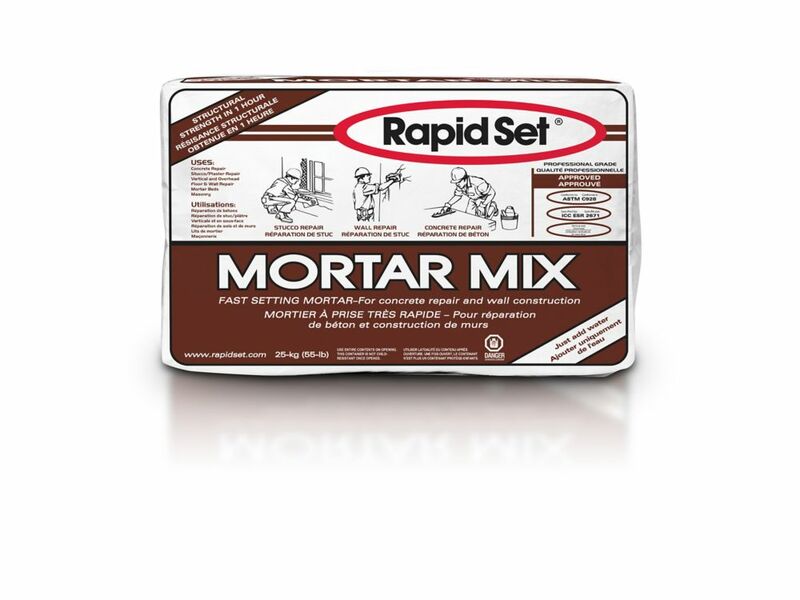 Mortar Mix Use Rapid Set 55 lb. Mortar Mix for repair and formed work. The crack-resistant, non-shrink formula is designed for strength and durability, and it works very well on overhead and vertical applications. 55 lb. Mortar Mix is rated 4.3 out of 5 by 230. Rated 5 out of 5 by sicric from Milky, with a thinning agent added, It looks like you just spilt a milk-shake as it conforms to t... Milky, with a thinning agent added, It looks like you just spilt a milk-shake as it conforms to the mold nicely. Rated 5 out of 5 by Mortarman from Works well when trying to work in cold weather.... Works well when trying to work in cold weather. Rated 1 out of 5 by HomeDepotCustomer from Must have been old. Did not mix correctly. Would like... Must have been old. Did not mix correctly. Would like my money back, butthebag is opened. May I use it for repairing my driveway cracks?